! I will be very happy to recommend Robert and his team. Such good value, reliable and consistently great service. We always enjoyed getting fresh fruit, vegetables and good quality meat delivered on a Saturday morning. It really made our weekend and my family loved all the produce we bought. The fish was always super fresh and Robert would go the extra mile if i had any odd requests; like wild caught fish bones which are quite hard to get apparently. I can’t thank Robert and the Farm Direct people enough. It was lovely fresh things and the raw milk and cream was always divine. Thanks so much for supplying us with such delicious, nutritious food in 2017. I was diagnosed with breast cancer in February this year and have had chemo, surgery and radiotherapy, which I finally finished this morning! During treatment I have had much less energy than usual and so have spent more time at home. Every week I have taken great pleasure from cooking delicious meals with the things we get from Farm Direct, trying out new recipes and spending time cooking new and unusual dishes, feeding my body with the nutrients it needed to get well. I have received the 'all-clear' from the hospital and from tomorrow I will begin my recovery. I realise this is quite a personal story but I wanted you and your team to know that for me, cooking with my Farm Direct delivery was actually an important part of my cancer journey, and I and my husband have had such fun and pleasure being adventurous in the kitchen due to the 'Saturday surprise' of whatever we were delivered. We've both learned lots of new things and have eaten like kings this year. I even started a 'weeklyvegbox' instagram! Looking forward to continuing as a customer in a happier and healthier 2018. Hope you and the team also have a wonderful Christmas. Thank you for my order, everything was perfect, as always. I made the most delicious crumble with the fresh rhubarb - comfort food, just perfect - plus the luxury of cream! Life is so easy with you at the end of my keyboard!! Just a quick note in regards to my shopping : this week's sardines were amazing. Baked them straight from the shop, in the oven and topped with olive oil, garlic (from you) chilli and coriander. Delicious. Keep up the good quality products. The strawberries, raspberries and tomatoes were so amazing. I stopped using FarmDirect because I couldn't justify the expense but the quality is so outstandingly good that I'd be losing out if I shop elsewhere. Thank you - we had a family apple crumble-making session on Saturday and shared (a little) with Grandma and Grandpa! Alfalfa was woofed in one meal. The honey is a big hit. The sounds of enjoyment were audible whilst my 7 year old consumed the broccoli. Also, later in the week I was asked - when are we having more purple kale...?! A particular highlight for me was the salad + the garlic flowers, so delish! Now... the butter is just too good! I could go on... This is how food should be. Thank you very much. I need time to meal plan Farm Direct style. that chicken soup recipe bundle is EPIC! Family said it was the best soup I'd ever made. Perfect for this weather. @Farm_Direct Made the Chicken soup from the recipe box. It's immense; possibly the nicest chicken soup I've ever had. We were not so much happy as ecstatic with everything we received from Farm Direct. The goose was outstanding and so was the pork, not to mention the root vegetables and the Christmas pudding! Everything was absolutely delicious.We'll be ordering again very soon. Thank you very much!! Best wishes for a happy and successful New Year to you and all your team! I can’t let another day pass without thanking you and the team for the most delicious turkey this year, as always. Truly succulent, tasty and good for several dinners after our Christmas roast. Thoroughly enjoyed both the ham hock and seasonal fish supper recipe boxes this weekend: super convenient, simple instructions, wonderful ingredients - and delicious results. Not to mention amazing value for money. What a joy, thank you! Great to see Farm Direct going strong 6 years in. I just had a look at my emails and we have been getting food from you since 2010 and I just wanted to say thankyou for 5 years of wonderful food! A particular highlight for me was the youtube lead butchery when a half a lamb was delived in 4 pieces! (I had missed the email asking if I wanted it cut up). I think I ended up stewing some prime cuts but I had a laugh and it was a good story to tell! Farm Direct really has changed the way that we eat and that we think about food. When TV chefs talk about seasonal food it seems like another world to the montony of the Supermarket aisles, but you have made it so easy to have access to this great local food. These days when the chef is on TV talking about seasonal food we often say .... "I think we've got some of that in the box this week"
And now we have one more mouth to feed as our little boy is 7 months. His first food has been seasonal vegetables that are full of flavour, it really is the best start we can give him. Thanks you, and please keep doing what you are doing! I was meaning to email to say thanks so much for the wonderful delivery of fruit. 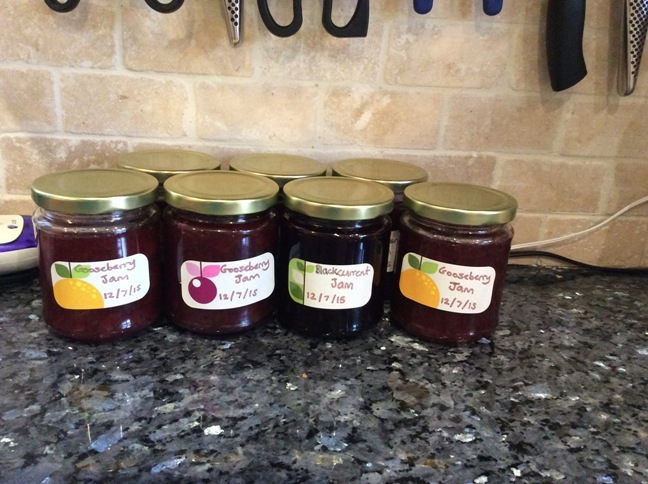 I made 10 jars of jam and the fruit was good value and in great condition. I look forward to ordering from you again! Yes very happy thankyou, was delivered efficiently, punctually and the products are great so far. Chicken was fantastic roasted and really looking forward to the rest of the shop for tea tonight!. Shall be back again for another order. I was happy with everything. Quality is really high (my boyfriend could write sonnets about your strawberries) and got everything I ordered. Won't be ordering next week, as I'm going on holiday, but after that I'm definitely placing another order. I'm so happy I found your site! The food is delicious and I feel so much better knowing I'm eating fresh & quality products. I will definitely order from you from now on. I loved shopping with you guys. Will definitely do it again. All the produce was such good quality and tasted so good. I'm very happy with the first order from you, and am actually planning to order our next box today! The produce was of fantastic quality and I'm enjoying trying a few new things. Can't wait to see what's next in my box. I'm very happy with my first experience. All the products were excellent, as was the service. I'll certainly use the Farm Direct again, and I already recommended it to some people. Very nice work and initiative. Just to say we had haunch of venison last week, cooked it in our outside oven: one of the best roast meats I have tasted! Thank you for my wonderful food this weekend - everything was delicious! The fish tasted as though it was just off the boat...all a delight. I thought that I'd drop you a line to explain why I voted against the idea of Farm Direct selling imported foods, even if they are fairly traded. The aspect which attracted me to FD in the first place was the notion that the produce would be British. Not only should we support British producers but we should also celebrate the best of British food as its reputation has taken a battering over the years. If FD does decide to sell imported produce it will, in my opinion lose its unique selling point and will then bear direct comparison with say Abel and Cole. This was the very reason I decided not to buy from Abel and Cole. As a supporter of the Slow Food Movement principles and its initiatives such as Terra Madre, I do believe that help should be given to those who need it to become self-sufficient in order to live their lives and raise the families in healthy and progressive environments however, there are other ways of achieving these ends. In summary, not only do I want to see good British food lauded but I also want to see the environmental damage of long haul transportation minimized. I don't normally write in about things like this but I am just so pleased with the service I have received from Farm Direct so far that I had to let someone know! Not only has the customer service been friendly, quick and personal, but the quality of the food is excellent. I recently swapped from Abel and Cole to Farm Direct, mainly because the boxes were cheaper, with more food. I was pleasantly surprised to find things I'd never had before, like wild garlic, in there. Also, the quality of the vegetables, on the whole, is so much better. My partner and I agreed that the tomatoes actually smell like tomatoes, which I have not found either with Abel and Cole or the supermarkets, ever. They smelled like the ones I used to pick fresh from the plant that I had grown as a child. The carrots this week were also really fresh and a lovely colour. This is exactly what I originally wanted from a vegetable box - really fresh, tasty, organic and locally sourced food. I really hope that Farm Direct doesn't get to the point that Abel and Cole seem to have done and stop being able to give such brilliant service and provide such high quality food at a reasonable price! Anyway, thank you. There was an Abel and Cole rep doing some door to door salesmanship last week, and when I said we were signed up to Farm Direct instead, he hung his head and said "a lot of people have said that". The venison was a triumph, slow-roasted on a bed of carrot, onion, fennel and rosemary in a generous pool of red wine and stock - was melt-in-the-mouth and much appreciated by the diners. The celeriac was wonderfully fresh and fragrant and the purple sprout tops added colour and texture to the meal. Wow! Two of us independently declared this evening that your Essex sweet corn was the most delicious we had ever eaten - and both independently found ourselves eating much of it with NO butter - unheard of! Though of course it was also amazingly wonderful with some of the Jersey salted butter and a bit of black pepper. Please pass on our compliments to the growers, and to yourselves for getting us it this fresh. The very best 'thing' over Easter has been the fresh fish. Having watched your video about the Cornish fishermen,I went on Thursday (before Good Friday) and got fish that had been swimming around earlier that day and bound for the sushi restaurants in the city. The freshest monkfish ever.Really amazing. So being able to pop into your depot as soon as the fish arrives is brilliant.Just like the seaside. I picked up a small haunch of venison from the depot. We had it last night and it was absolutely delicious. I just roasted it on a rack, brushed with oil, garlic and oregano, and the juices made wonderful gravy. Would definitely go for that again! This is to thank you for your excellent service and superb turkey. The Free Range Kelly Bronze Essex Turkey was the most succulent and tasty we've ever had. In today's retail environment, it was really touching and very much appreciated to be dealing with you and your business; your personal touches and attentions did not go un-noticed and I've been singing your praises to friends and neighbours alike. I've been buying produce from your shop in the alley on Ronald's Road for a while now: I saw you one morning while picking up croissants across the road, and it's quickly become a happy habit on the odd Saturday morning. Finding out that you deliver was like a Christmas present. I look forward to using your services many times in the future. The produce was all very beautiful. We had a big family dinner on Sunday night to sample many of the items I'd bought and the praises rang high and loud from my hungry guests. I can't wait to order my next Mixed Veg box next week and see what's in it. My husband recently surprised me with Hugh Faernley-Whittingstall's new Veg book and we're using it to tell us what to do with the abundance or turnips and carrots so forth we received. Thank you for existing; you make our lives better. We love your fish: that it is fresh, local, and that it is just what you caught in the sea that day. We do not by any means require a massive selection and would like to eat fish that is both sustainable and fresh. If that means learning a few new recipes, that can be fun too. We had Nurse Hound(By-catch we understand) last week and it made one of the best fish curries we have ever had. Let us know if we can be helpful customers in terms of encouraging sustainable fishery practices. We understand you had to throw back 300kg of cod last week which sounded awful. If it makes more sense to fish for something other than white fish, please do so! We will be happy to try and cook it. Thanks also for the recipe. On other products, the apple tart was surprisingly good. I'm half French and picky about my tarts and yours made the grade (lots of butter!). We will be ordering it again. The veg box is nearly gone, and we appreciated the variety and quality. We will be trying your cheese offering next. All in all, we love the service, that we can pick up or that you can deliver. And we love the model that the food is fresh and seasonal. We also like hearing where the food is from. I love Farm Direct & the fantastic quality, choice & value.I just wish I'd started using it sooner! I know I ordered late and I actually thought you wouldn't be able to do it so it was a lovely surprise and thanks for the great service! Happy Birthday too and thanks for the apple tart. It was lovely! We were away all summer so its nice to come back to great produce. I think you have a really good concept and I ll certainly be ordering regularly, although we do go to the Farmer's market at Alexandra Palace on a Sunday too. We have a company where great service is our priority so once again I really appreciate the service you give. I hope your company succeeds and will always be a regular customer! very impressed and happy with the service. Forget that parsley – and those miserable little chard shoots which failed to grow into anything remotely edible… I no longer need them! I have just discovered Farm Direct, a delivery service in Islington which collects produce from local (max. 70 miles from London) farms and delivers to your door. Well, no big deal, you might say – there are loads of such services around. And no doubt there are but, to my shame, this is the first time I have actually used one – although, in fact, on this occasion I went to their little warehouse in Islington to buy and collect rather than be delivered to. The principle is, of course, impeccable. The produce comes straight from the farm – minimum food miles, maximum freshness and fewest possible intermediaries between farmer and customer. What impressed me was the quality and originality of the products. For £35ish I bought several bags of curly kale (for the new Vitamix smoothie maker…), wonderful baby fennel, beetroot with greens, fresh gooseberries, tomatoes (and I mean ‘real’ tomatoes with taste…), tender young broad beans, to-die-for young snow peas, apples, three home-made pork pies, bacon, purple spring onions, cabbages, sea purslane (a sort of flat leaved cousin to samphire) and an enough-to-feed-three pack of monkfish liver, for a mere mouthful of which I would paid £35 in Japan or New York! The monkfish liver awaits me tonight but we have already gobbled up the snow peas, two pork pies, several tomatoes (served with the fresh fennel fronds and the purple spring onions) and the snow peas. And now I just cannot wait to go onto the Farm Direct website and see what might be available next week – especially since, on the website I will be able to see which farm the products will come from and read all about that producer. Grow your own veg? Nah! I’ll stick to flowers and let those guys who have come to such a productive accommodation with vegetables grow them for me…. I just wanted to say how gorgeous the strawberries were - sweet and absolutely full of flavour. The broad beans and peas were particularly delicious too - so fresh. I am utterly delighted with the orders I have received so far from Farm Direct. You offer a fantastic range of products and I am certain you cannot be beaten in terms of flavour and freshness. Even when my meal planning goes a bit awry and I end up finding week old chard in the bottom of my fridge it still tastes as good as if it had just been harvested. I have never bought vegetables from anyone before that compare so well to what I grow myself and we have wolfed down every scrap of the meat and fish we've bought from you - all of which has been wonderfully full flavoured, tender and perfectly delicious. The chicken we ordered from you last week was superb and provided us with three meals. I am astonished that you are able to provide such a wonderful service and at such competitive prices. Long may it continue! My baby is now two months old (our first baby). I started using your website soon after his birth and, since our first order, I have been recommending you left, right and centre to all the new Mums I meet. I will be weaning him in a few months' time and he's going to get lots of delicious seasonal goodies thanks to Farm Direct. Your service also means I don't have to haul him around the supermarket (which, like all discerning young infants, invariably make him cry). And I can buy all our food for the week from you, something I always struggled to do at the farmers' market due to their high prices, limited range and hit and miss quality. Thank you! And please let me know if there's anything more I can do to help support what you're doing. Just to say that we had an entirely Farm Direct dinner on Sunday night, the rump steak was a wonderful flavour, the chard delicious, we had the spinach to which we added pinenuts raisins and anchovies, as well as the mixed organic bag of leaves with yellow and red plum tomatoes! I am completely overwhelmed by your kindness in sending my cornucopia of delicious goodies this morning. I am absolutely thrilled and love your choice - I have already eaten the crab but have so much more to look forward to and whet my appetite, including unexpected treats like the pea soup, rhubarb, ray wings, mackerel, paté, kale, leaves, and much much more. Julia Singer, Barnsbury, Apr 2011. I love Farm Direct produce and you can always rely on getting the best ingredients! The website is very easy to use, and I never had any problems collecting my order either. What a great find farm direct is! I have been using you for about five months now, and since January alone have lost ½ stone through all this healthy eating, and that has encouraged me to exercise as well. I also spend much less money each week, only buying things I want and not throwing things in my supermarket trolley that I often end up throwing away (I never knew I could have survived the winter on apples, pears and rhubarb!). And it has made me much more inventive in the kitchen, boiling up my chicken bones, using the ham hocks - I had a venision haunch recently and have roasted, curried and minced it (and frozen the rest!). And of course I feel I am doing my bit, with all the food local and so a low carbon footprint. Am I wrong, or are you going from strength to strength?I do recommend you to all and sundry because you really don't do cr*p - always fresh, always good; all your meat is excellent, it's like having a really good local butcher. These weekly notes are one of the best parts about Farm Direct. I love knowing about what is coming in and going out of season and how the producers make their decisions about what to supply us. It's also great to get the other details on how the tides affect the fish catch, etc. This information has led me to try some new types of meats and vegetables this spring with resounding success each time. One of the best things about buying from Farm Direct is that you don't have to commit to a weekly veg box every week if you don't want to: you can simply pop in to the depot on Ronalds Road and take your pick. We had a wonderful christmas feast - the goose was superb, the veg equally fantastic and the smoked trout a real treat. James made Hugh F W'spear & celeriac stuffing and I think this combined with the goose is the future of christmas dinners in this household! Appreciate it must have been quite a palaver with all the snow, so well done and I hope you have had a nice rest this week. We're already missing our sprout tops and squashes and are looking forward to our first order of the new year. 'The lamb was absolutely delicious. Really made our christmas meal. Thanks for all your wonderful service over the last year - has it been that long already? We certainly rely on it now for our meat, veg and weekend loaf. 'I run pop-up restaurants and cater for large parties called Pips Dinners and I'm always looking for really interesting locally grown produce at reasonable prices. There are hundreds of so-called 'online shopping' ventures but the problem is that they in no way replicate the shopping experience we have face to face and are hugely unreliable in terms of customer expectations and price. 'Robert, the sausages, corn, butter, milk & damsons are all divine. We are in food heaven, thank you. "I love your produce and your friendly staff - you're doing it all right as far as I'm concerned!" "We think you guys are wonderful - fantastic food and a fantastic service! Thank you!" "I was recommended farm-direct by a friend and our household have been really pleased with the order we had delivered at the weekend. Personally, I have spent time living on various organic esque farms and such and was delighted to see fruit and vegetables that reminded me of those times, irregular in shape and very tasty. It was also nice to get a text to know when the order was coming – this was really useful." "The service was really good. All the fresh products have kept well & the apple juice is delicious. I particularly appreciated getting a text with a rough time for delivery - so I didn't have to wait in all morning...all in all I think it's a great idea!"